Rapid tooling is, simply, the creation of a mold in a shortened timeline. Rapid tooling got its start in the 1990s, when engineers involved in injection molding wanted to see if they could build molds in a matter of hour or days instead of the weeks or months a machined mold would take. A rapid-tooled mold is ideal for prototyping a part and molding a few hundred plastic parts before full-scale, high-volume production starts. The part of the tool that is built in the rapid tooling process is the insert—including the core and cavity, and the side actions. Depending on the type of rapid tooling used, you may be able to get thousands (or tens to hundreds of thousands) of cycles out of the tool. The mold has to be strong enough to handle the injection molding process. Injection molding machines are measured by pounds per square inch that are being clamped—so if the mold material isn’t strong enough, it might not survive. Additionally, the mold must be able to withstand injections of (typically) hot plastic material. The mold needs to be smooth enough for the plastic part to eject cleanly. Traditional steel machined molds are polished or smoothed to make ejection easy—but during some rapid tooling processes, material is built up in layers, which aren’t necessarily smooth. This means the rapid tooling mold could require additional work after it is created to make it smooth enough for prototyping. The mold may not have tight enough tolerances. All plastic injection molds need a tolerance of +/1 .001”, or it may leak plastic and render the prototypes useless. Depending on the type of rapid tooling used, this may be difficult to achieve. 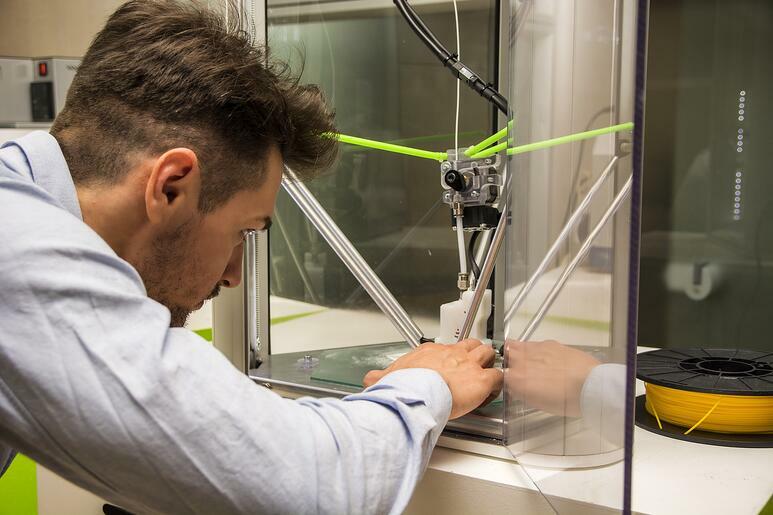 3D printing plays a number of roles in plastic injection molding—and it has evolved to the point that some additive manufacturing machines can print a plastic injection mold. The benefits of 3D printing in plastic are threefold: The molds can be created extremely quickly (within a few hours, in many cases); the molds are inexpensive to create as compared to printing in metal; and the machines can create virtually any geometry needed. That said, today’s 3D printing technology doesn’t enable exceptional part tolerances. While you may be able to get a prototype run out of a 3D plastic injection mold, you won’t be able to get volume out of it. Metal isn’t only used for rapid tooling through traditional machining (as we’ll discuss in #3)—it can also be used to create a plastic injection mold by fusing together metal particles to make a solvent in a process called “sintering.” In rapid tooling, the sintering process is done by spraying a cloud of powdered metal into a laser beam, which allows you to “draw” the shape of your mold with the laser. This process can be done using a number of different metals, including stainless steel, titanium, or cobalt chromium. And because the finished mold is made of metal, it is better equipped to handle heat transfer, pressures, and ejection capabilities. One of the things that makes sintering unique is that it allows you to print in conformal cooling lines to help cool the plastic part more rapidly. Say, for example, you’re creating a mold for a deodorant cap with a unique shape on both sides. Because of the contouring of the lid and the thin wall it requires, you need to be able to cool the plastic once it enters the mold as quickly as possible to keep it from deforming. This cooling process is possible thanks to conformal cooling, which uses cooling lines buried within the steel. Keep in mind that while sintering is fast, it’s not accurate enough to achieve the required +/-.001 tolerance right out of the machine. Instead, it will achieve a tolerance of +/- .004 or +/-.005, but to get the tighter tolerance, you will have to have to add the additional accuracy in by hand through the use of traditional machining or electrical discharge machining (EDM). Additionally, sintering can be expensive compared to rapid prototyping in plastic. When the processes for rapid tooling came out, companies that built molds using traditional methods (like machining aluminum or steel) began to increase the speed of those methods to compete. Eventually, the term “rapid tooling” was applied to any tool that could be built quickly, including those created with more traditional methods. Some companies can turn a metal mold around in a few days to a week. But this rapid tooling method isn’t without its limitations, one of which is geometry. If you need to cut a cavity of a shape, you’re limited by the cutter the company is using—you can’t cut a square corner with a round cutter. To address that issue, you’d have to burn in the corner you need through EDM. If you need a highly complex geometry in your mold, it could be more expensive to do rapid tooling in traditional machining. Are one of these types of rapid tooling right for your product? Keep in mind that just because you can create a mold with rapid tooling doesn’t necessarily mean you’re going to save a great deal of time. As described in some of our examples above, the rapid tooling mold creation process is typically faster than traditional machining of steel or aluminum, but it often requires finishing touches that can slow your process down once the mold is created. If you have questions about creating a mold for your plastic part, contact us and let us know. One of our industry experts will be in touch with you as soon as possible!